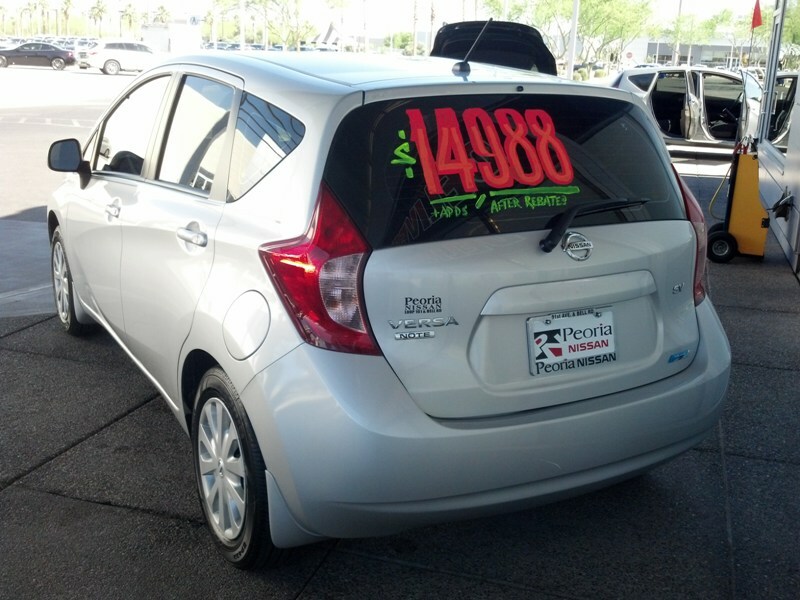 The Versa Hatchback is completely redesigned for 2014, including a new name: the Note. 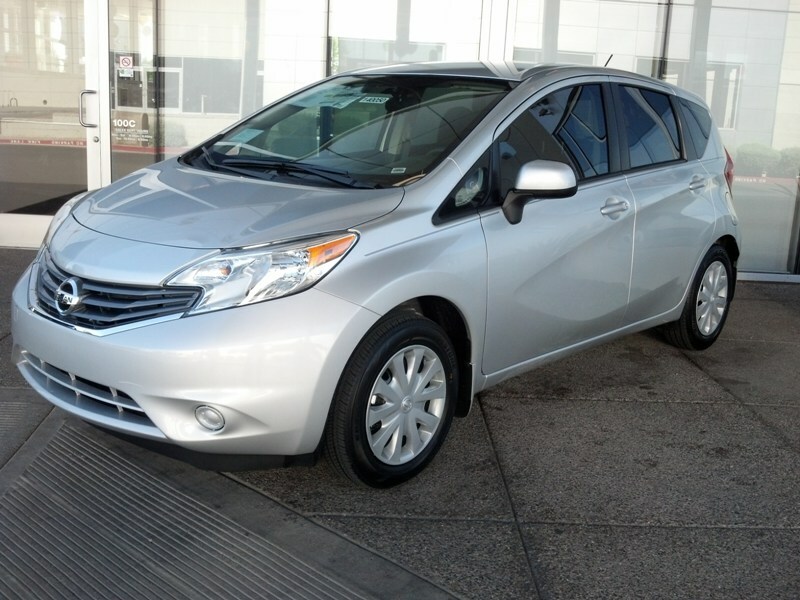 The Versa Note is not the type of car I would be interested in buying. However, I do know someone who will soon be very interested in a cheap car that gets good gas mileage. Our teenage daughter. She came along with me on the test drive and she gave me her honest opinion on everything from the looks to performance. Her summary will follow mine at the end of this article. 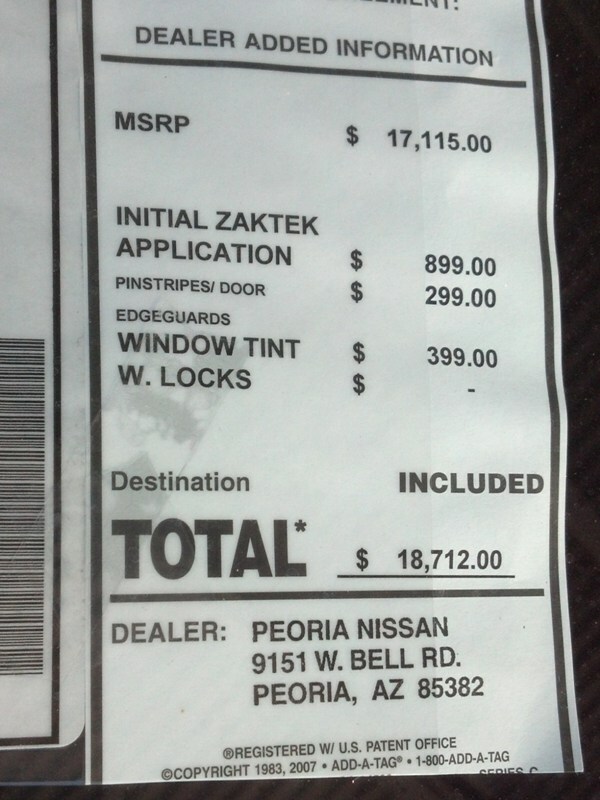 As always, I have to thank Charlie at Peoria Nissan for letting me take the car for a test drive. If you live in the area and you are interested in the Note, or any other Nissan, please put Charlie at the top of your list. He will absolutely make sure you get the best deal available. 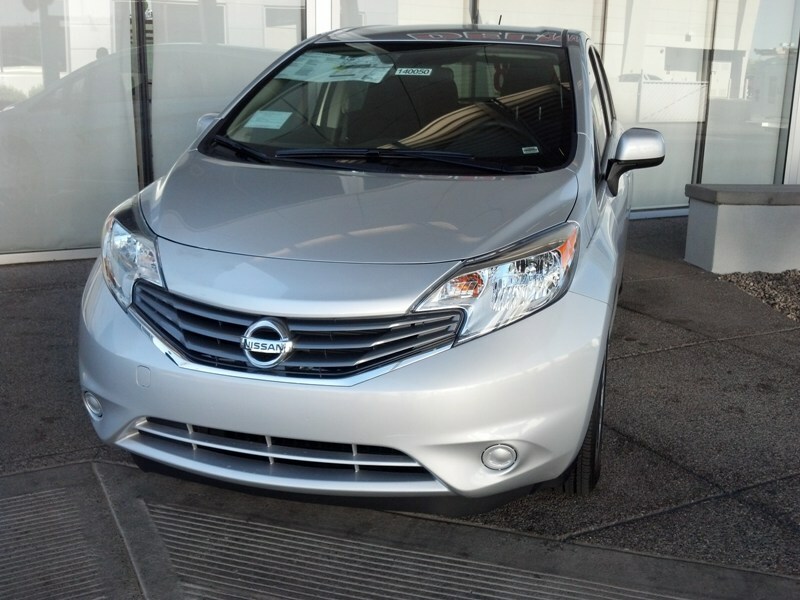 The Note looks nothing like the newest Versa sedan, and that’s a good thing. I advised Charlie NOT to park the two models next to one another because they’ll never sell another sedan if they do. I liked the exterior styling. It wasn’t boring but it wasn’t too overdone either. The interior passenger room was my absolute favorite thing about the car. I sat in the back seat of the car and slid the front seat back all the way. It didn’t touch my knees. That’s pretty impressive for such a small car. The back seat was also wide enough to seat 3 normal size adults without being crowded. The back seat was quite comfortable. Unfortunately, I can’t say the same for the front seats. 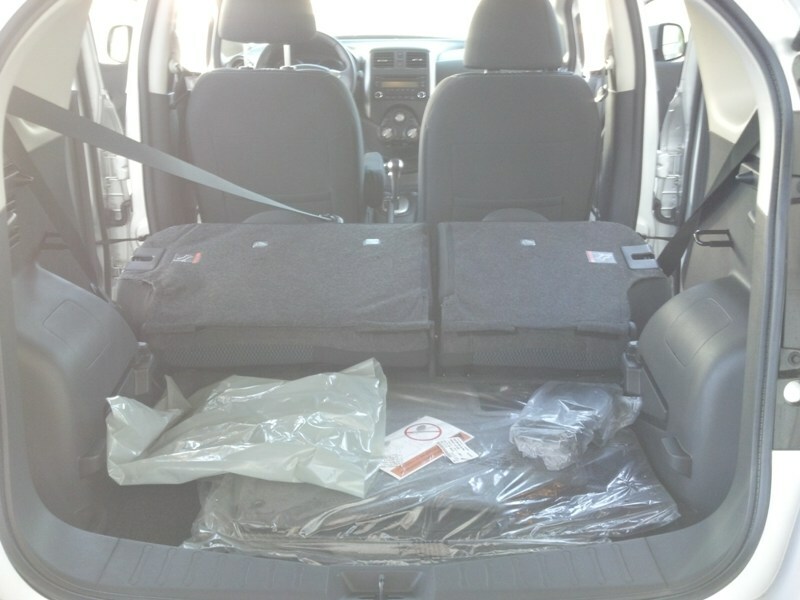 The back of the seat and the bolstering were nice but the pan was very hard and uncomfortable. There’s no way I would embark on a long journey in this car. Bad seats are my pet peeve. If the seats aren’t any good, it pretty much ruins my whole opinion about a car. It’s not that hard to get them right. I’ve sat on 40 year old seats in classic cars that are way more comfortable than these. The rest of the interior reminded me a lot of the Cube. The gauges were the same, controls were the same, the plastics felt the same. Easy to read, easy to control, intuitive. The plastics seem to be a bit cheap but this is a cheap car. Cargo room was impressive. After I had finished crawling all over the car, we went for a drive. This is where things started to get real and you could really see where all of the corners were being cut in order to save money and improve fuel economy – the two end goals of Nissan with this car. I can not stress this enough, the car is gutless. I had my foot in the floor and very little was happening. I know two things for sure: that we were going forward and that I was scared to death to drive it onto the freeway on-ramp. The power was so scarce it felt like the e-brake was on. Pairing a 1.6L 109 hp motor with a CVT transmission is a sure recipe for going nowhere in a hurry. Before the advocates pop in here and start telling me that the CVT is the best thing to come down the assembly line in a decade let me assure you that you’re wrong. We have a Cube paired with a CVT. I know better. I would hate to be driving this car and have to negotiate any type of emergency situation. There wasn’t any noticeable wind noise but that was probably because the road noise was so loud. The turn signals didn’t work on this car (it only had 47 miles on it!!!) 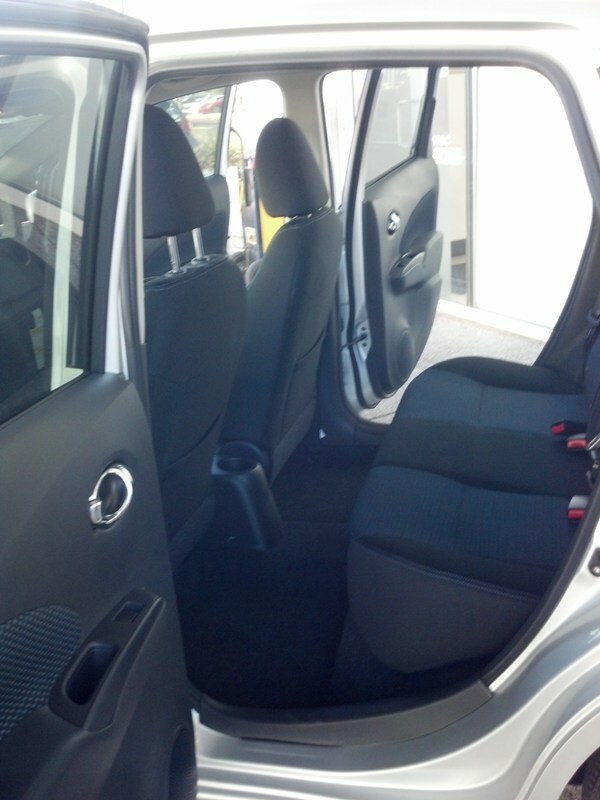 and the automatic door lock feature didn’t engage until I hit a bump in the road, about 7 miles into the test drive. The brakes were very soft. There is an alarming amount of distance between the time you touch the brake pedal and the time the car stops. I’ve driven lots of cars with questionable stopping power. We have 8 cars that are over 40 years old. This should not be an issue in a brand new car. 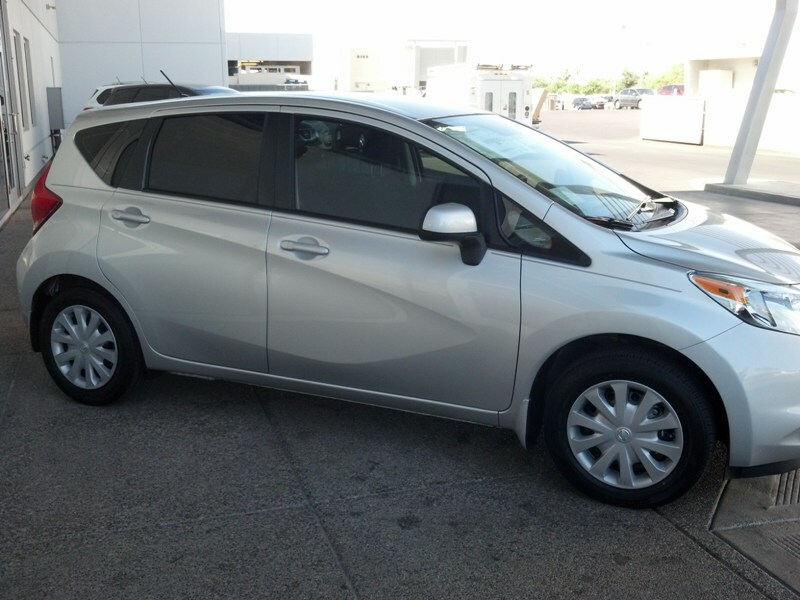 Nissan’s redesign of the Versa hatch was a good idea. The previous model was beginning to look dated so it was time to shake things up a little bit, give it a more modern design, and improve the fuel economy. However, even though the aesthetic change was a win, what they did to the power train was a failure. It doesn’t mean that the car won’t sell. I’m sure the retirement communities here in Arizona will be full of them, as well as the parking lots of Hertz, Budget, and Enterprise rental companies. However, I think they missed a great opportunity to attract another group of drivers. Young people. I know hundreds of people under the age of 25 and I don’t think a single one of them would buy one of these cars. Even the drivers of the previous generation would have a hard time trading theirs in on a new one. The new model has a smaller motor, 1.6 vs 1.8, 13 fewer horsepower, and 20 fewer ft lbs of torque. The end result is a gain of 3 mpg in the city and 6 mpg on the highway. It won’t be justifiable for most people. Our daughter is one of those people. She’ll be driving in less than a year. After the test drive was over, I asked her to give me her honest opinion about the car. 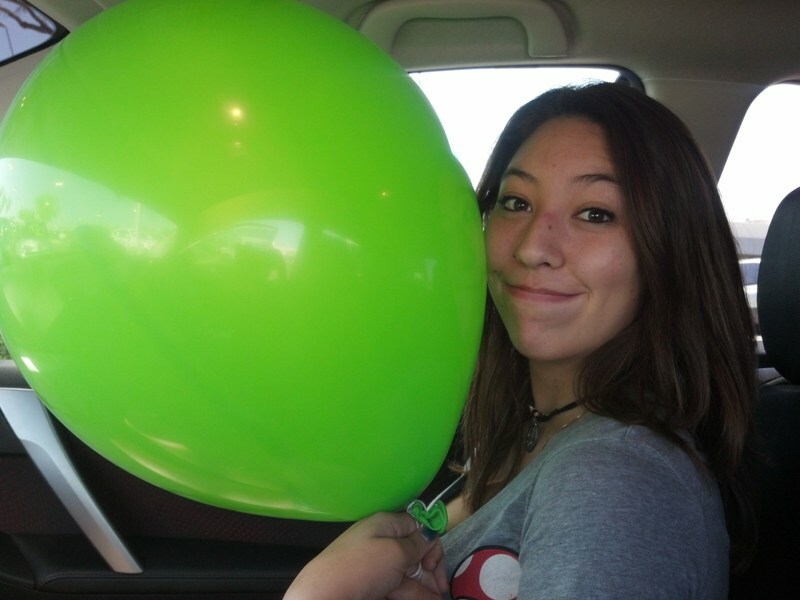 She loved the fact that it was roomy and that the controls were simple and un-cluttered. 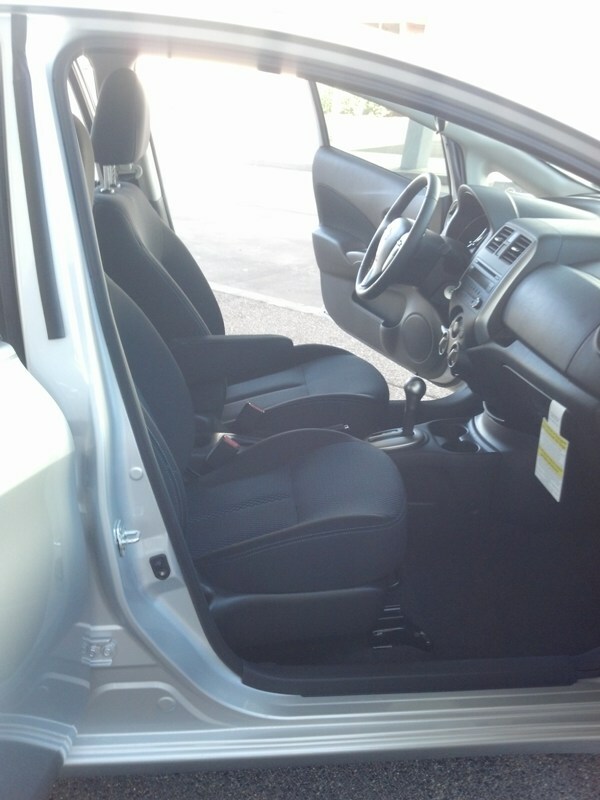 She liked the fact that you could fold the seats down flat in the back and haul stuff. However, she didn’t like the feel of the front seats, she didn’t like the fact that if didn’t have much power, and she thought that the styling was a bit too old-looking for someone her age. She said it looked more like a family car than a fun car. I’d spend $2,000 more to buy her a Sentra. It’s a much better car for not much more money and I feel she would be safer in it than the Note. 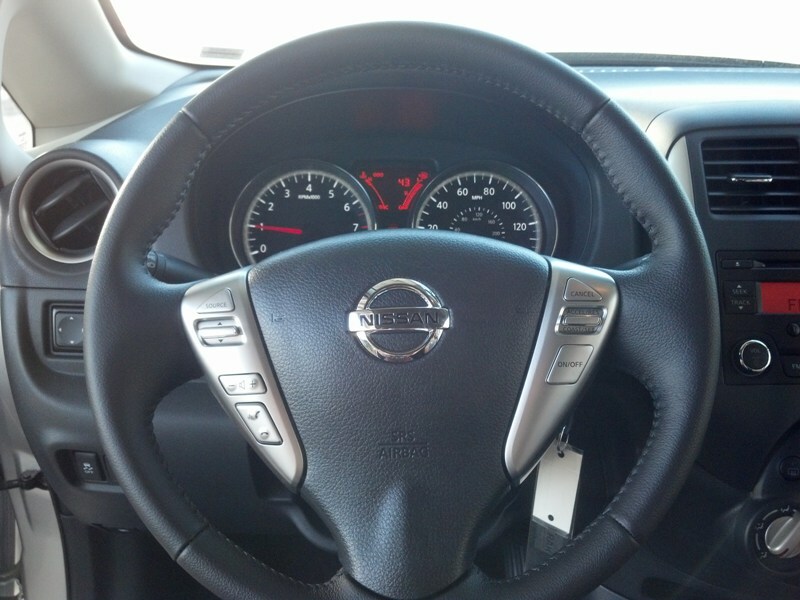 The Sentra doesn’t have the brake issues and it has more power. In summary, the only thing I really, really like about the Note is the interior space. There is lots of room for people and all their stuff. The gauges and controls are nice and simple and the dash feels uncluttered. The exterior styling was OK but it wasn’t anything that grabbed my attention. The brakes were my biggest complaint, followed closely by the non-functioning turn signals and late to engage automatic door locks. These are all safety issues and I have a huge problem with that. I don’t like the CVT paired with any motor less than a 2.0L and the front seats were way too uncomfortable to even consider a long trip. I would not buy the Note for myself and I wouldn’t buy one for my daughter. Everything I dislike about the car is a much bigger priority than the fuel savings. It was a good effort on the part of Nissan but I feel like they missed their mark. Becky (nissangirl74) is a long-time Nissan and Datsun enthusiast and collector and the Business Manager for NICOclub.com. 2016 Nissan 370Z – The Legend Continues, but what’s next?